U.S. Marine Maj. Randy Pugh received a huge hug from son Nicholas, 10, watched by daughters Savannah, 10, left, and Morgan, 6, and wife Ann. 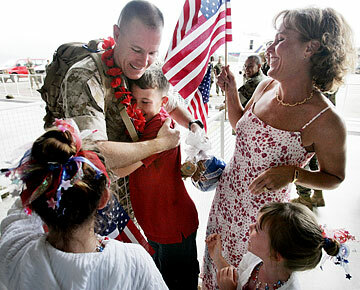 Pugh was among the troops returning from Iraq yesterday to Marine Corps Base Hawaii at Kaneohe. Marine Staff Sgt. Paul Pamrow returned from his third combat tour in Iraq yesterday, and unless things change drastically it will be a while before he goes back. "I am relieved," said Pamrow, 36, among the 210 members of the 3rd Radio Battalion who returned to Kaneohe after a nine-month tour of duty. His 3rd Radio Battalion is now assigned to the 3rd Marine Expeditionary Force on Okinawa and has been taken out of the current Iraqi rotation. But as these Marines look forward to picking up their lives, another 900 members of 3rd Battalion, 3rd Marine Regiment, will leave Kaneohe next month for Iraq -- after being home for only seven months after a tour in Afghanistan. 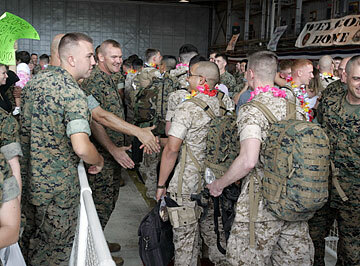 Marines of the 3rd Radio Battalion returning from duty in Iraq were greeted yesterday by their comrades at Marine Corps Base Hawaii, in Kaneohe. Fifteen members of the 3rd Radio Battalion, like Pamrow, have made three Iraqi combat deployments. For another 57 Marines, like Staff Sgt. Charles Willson and Maj. Randy Pugh, it was their second tour. The battalion participated in the invasion of Iraq in 2003 and returned to the Sunni Triangle for its second nine months of combat in February 2004. For the past three deployments, the Kaneohe Marines provided communications and intelligence support for the 1st Marine Expeditionary Force, stationed at Camp Pendleton in California. That job has now been assumed by the 1st Radio Battalion from Pendleton. Commanded by Lt. Col. Robert Coate, the 3rd Radio Battalion has some members already working with the 31st Marine Expeditionary Unit from Okinawa as part of the 5,500-member U.S. force that was supposed to participate in the Balikatan 2006 war games in the Philippines. However, 1st Lt. David Post, spokesman for the 3rd Radio Battalion, said those Kaneohe Marines are now involved in the humanitarian relief effort after mudslides on Leyte island. "They are doing good," said Post. "They are glad to be helping in the relief operations." 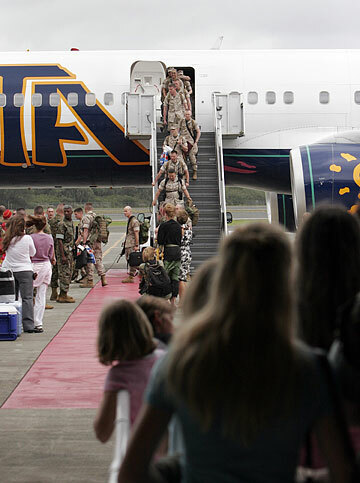 Marines of the 3rd Radio Battalion arrived yesterday on a charter flight. 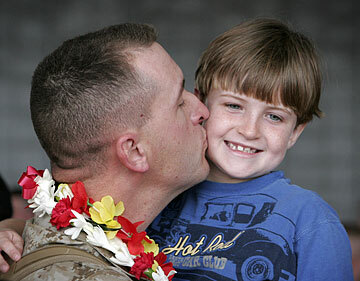 Chief Warrant Officer James Musch, 4th Platoon commander, kissed his son Nathanael, 7.